As a juggler, I spend hours working on a single trick and basic moves on my path to mastery. Unfortunately hours of training the same thing over and over can negatively effect my arms and shoulders. 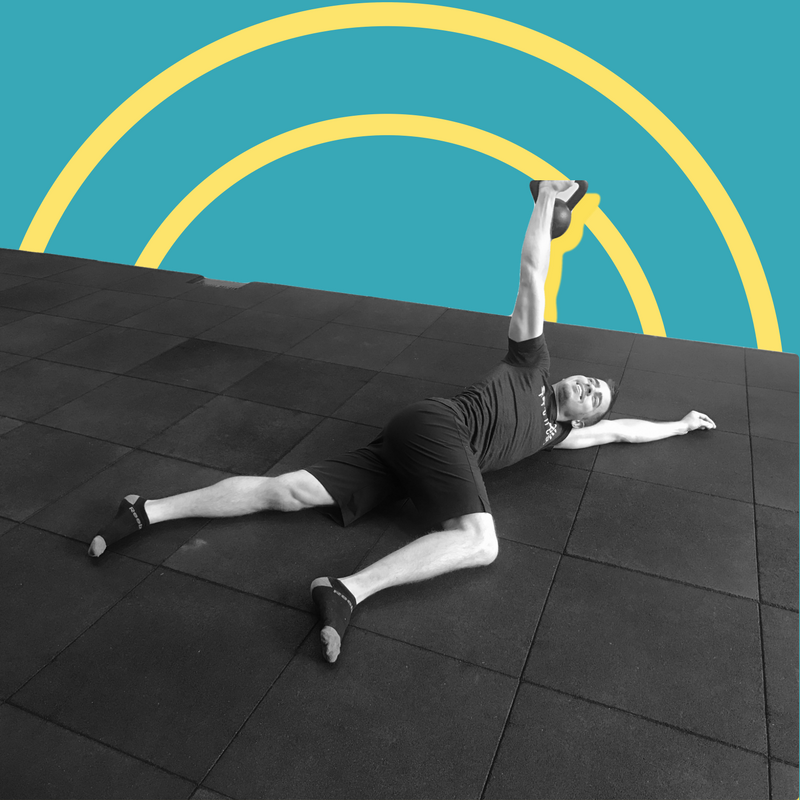 Consistently performing these specific movements over time has limited my shoulder mobility, making it difficult to do backcrosses (behind the back throws) and other juggling tricks. To combat my body getting tighter, I use a handful of shoulder mobility exercises. There are plenty of great options that can be used to achieve better range of motion for the shoulders. For the sake of this article, I have narrowed it down to four exercises in four categories: mobility, myofascial release, working opposing muscles, and creating new movement patterns. The Kettlebell Arm Bar is a movement and hold that improves flexibility of the shoulder and pectorals while working shoulder stability. This exercise helps me open my chest and shoulders before attempting behind the back throws. To get into the Kettlebell Arm Bar lay face up on the ground in a single arm 8kg kettlebell press. Next, rotate one leg over the other while keeping the kettlebell in a press position. Allow the hips to rotate down to recieve a stretch in the chest and stability in the lats. Check out the video below to see how to get into the arm bar position. There are many points of the shoulder and surrounding muscles that can be released. Using a lacrosse ball I focus on the most critical point, the inside shoulder also called the anterior deltoid. Choosing the lacrosse ball instead of the foam roller allows me to penetrate deeper into the muscle. While releasing the shoulder be sure to take your time. When you find a tender spot pause for 30 seconds before moving on. Another trick when releasing your shoulder is to move your arm into different positions to increase the effects of SMR. Juggling uses a lot of muscles including anterior shoulders, biceps, chest and core. The major opposing muscles I work on is my upper back and posterior shoulders. Two exercises I like to use are Standing Wall Reaches and Scarecrow to External Rotation. Both of the exercises are similar and work well for me. For some of you the Standing Wall Reach may feel more like a stretch but if you have tight muscles you will feel your posterior shoulders and upper back working. And for a little more active work you can perform the Scarecrow with External Rotation with a band at high reps.
What good juggling comes down to is having a variety of movement patterns in your toolbox. The movement for a backcross is not a common movement that people use. Because this is a foreign movement I have to train with the Straight Arm Pull Back movement. Using an anchored band at waist height we can create a new movement pattern. Keeping our arms straight and palms facing back we can activate muscles that are specific to backcrosses. Because training juggling can create a specific movement pattern in my shoulders I have to constantly stretch and train my shoulders to be well rounded. My shoulders are continuing to gain mobility and my behind the back throws are improving. Be consistent and patient in your mobility training and you too can create new movement patterns to improve your range of motion.